Israeli soldiers abducted, overnight until early morning hours Monday, at least nine Palestinians, including former political prisoners, from their homes Ramallah, Jenin, Nablus and Bethlehem, in the occupied West Bank, the Palestinian Prisoners’ Society (PPS) has reported. The PPS office in Ramallah, in central West Bank, said dozens of soldiers invaded the ar-Reehan area, north of the city, searched homes and abducted one Palestinian, who remained unidentified at the time of this report. In Jenin, in northern West Bank, the soldiers abducted Samir Abdul-Halim Burhan, 17, after stopping him on a Palestinian land, near the al-Jalama military base. 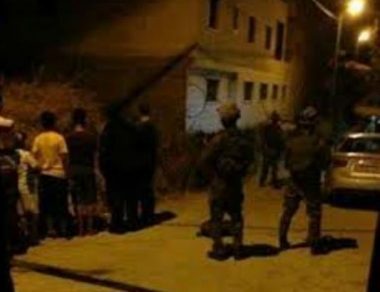 Also in Jenin, the soldiers searched and ransacked homes in Arraba and Qabatia towns, south of Jenin, and abducted five former political prisoners, identified as Ja’far Ezzeddin, Bakr Mohammad Abu Obeid, and Mustafa Shehada Sheebani, from Arraba, in addition to Naji Samir Nazzal, and Yousef Raed Abu Khamira, from Qabatia. In Nablus, also in northern West Bank, the soldiers abducted a political prisoner, identified as Zayed Hasan Mleitat, 35, after invading and searching his home in Beit Forik town, east of the city. In related news, a group of fanatic illegal Israeli colonialist settlers infiltrated into the al-Lubban ash-Sharqiya town, south of Nablus, punctured tired of several cars and wrote racist graffiti, before the locals noticed them and chased them away. In Bethlehem, the soldiers invaded the Rashaida village, east of the city, and abducted Mohammad Suleiman Rashaida, from home, after invading and searching it.